When the engine was out was the transmission separated from the engine? How was the hub, may be sticking. If the clutch was out was it correctly installed? When giving it gas and it is hung up does it slam in gear? The engine was separated from the transmission. The clutch was out, but reinstalled correctly. It doesn't slam into gear. It's actually pretty gentle. 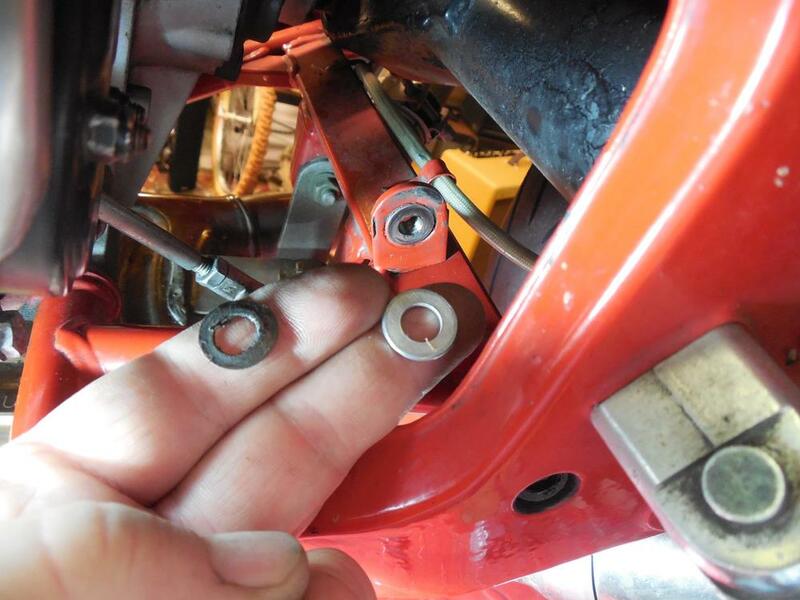 Did you use an alignment tool to reinstall the two friction discs and intermediate plate? .. gap between lever and `pork chop`when downshift ? There is a gap between the lever and porkchop. Other than the obvious oil leak, how does this look? The two "arms" (one on the gear box, the other on the foot lever) should be parallel. This is accomplished by shortening the connecting rod length. This also adjust the height of the foot lever off of the sideplate. Rotating the pawl arm connected to the gearbox might be necessary to get it all into fine fettle. Also, you are missing a lock nut on the forward Heim joint. How much "play" in the foot lever when you wiggle it around? 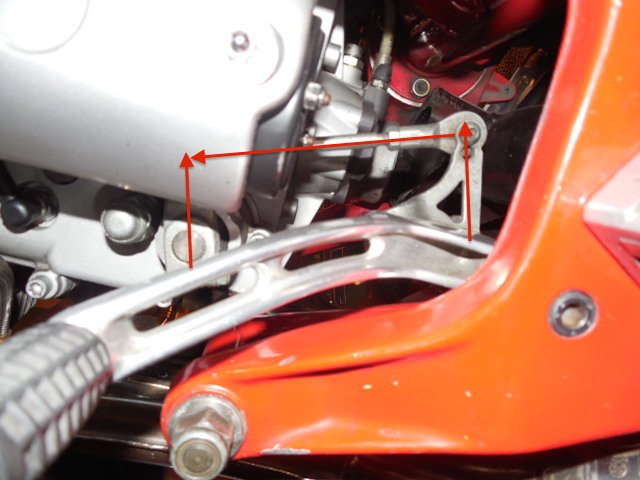 PS: Check the gap under the foot lever when it is pressed fully down in various gears. Make sure it is going completely into gear, and look for the gap under the foot lever. (You can see where it has hit and chipped the red away). There is about 1/4" play in the foot lever. I can't shift higher than 2nd without the engine running. 1/4" is a lot of play. It will be worth grooming that mechanism. I am looking for the image of the "parallelogram." Quite possible that when you are trying to shift 4->3, 3->2 that the foot lever is striking the sideplate. 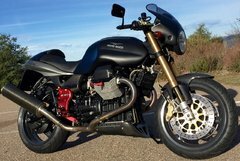 You can probably wiggle the gearbox into each gear by pulling the clutch lever, working the shift lever, and rocking the rear wheel back and forth. I'm out of daylight and my power is still out, so I'll have stop for the night. I'll see if I can convince my girlfriend to rock the rear wheel for me tomorrow. A girlfriend is as good as two monkeys, right? Thanks. That definitely looks different than my setup! Looks like the best place to start. I had a shifting problem once because the nut on the forward heim joint was hitting the starter. I turned it around so the screw head faced the starter and the problem was solved. It's great when a fix can be as simple as that! Looking at the picture that docc posted versus my setup, I'm growing more hopeful that this could be a simple solution, too. The bike has been out of commission for over three years, and I barely got to ride it before the engine needed rebuilt, but I do remember there being some shifting issues back then.